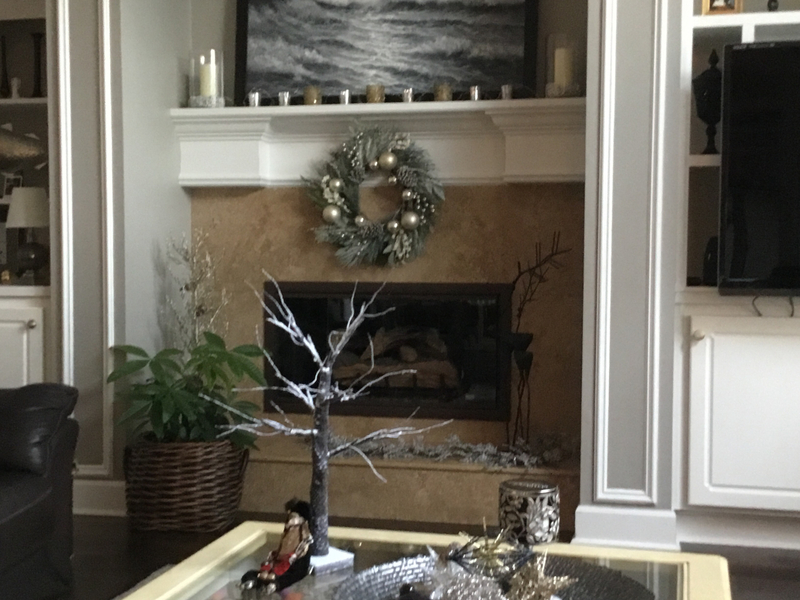 For those of you who grew up either chopping your own wood or buying split wood and storing it for the winter, you can easily recreate the look in your own home without the hassle using the Real Fyre Split Oak Designer Plus Gas Logs by Peterson. 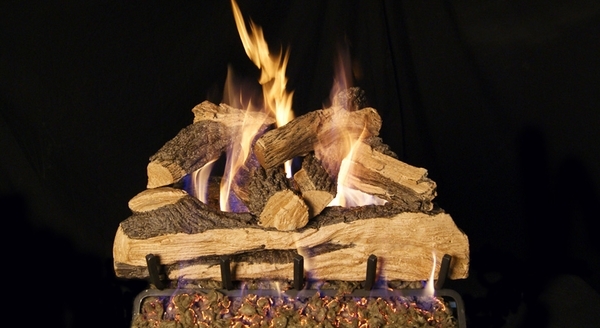 Each set of gas logs looks like the split oak wood, cured for seasons that you remember. The logs not only look great, but are constructed of the highest-quality materials in the industry and reinforced with steel rods. The handpainted surface details and gas flames dancing realistically through the holes in the top logs provide the finishing touch. You don't need to give up the homey look of split wood and you don't need to break your back trying to fill up the woodpile. 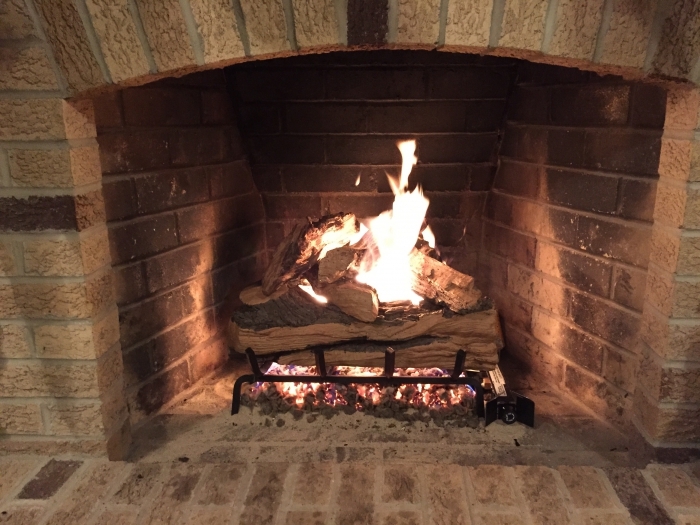 All you need is a set of Real Fyre Split Oak Designer Plus Gas Logs by Peterson and you and your family can continue to have your winters the way you like them. * The fireplace's Middle Width must be at least 29 Inches and the Depth must be at least 14 Inches for this gas log set to fit. You can calculate the middle width of your firebox by measuring the width (left to right) approximately half way back in the firebox. If you have any questions, please contact our customer service department and we will be happy to assist you in finding the perfect size gas log set. Can the gas line be on the left (when looking at the fireplace)? When using a match light burner, the gas line can be on the left or right side. The burner will come with the gas supply configured for the right side, but the burner cap can be easily swapped to allow a gas feed from the left. Everything is more realistic than expected. Variable remote control really allows one to adjust flame nicely. Only wish there was an add on blower unit. Cozy around the FP when the doors are open. Great price. Fast shipping. I ordered wrong set to begin with, and it was an easy return and credit. The tech guy I dealt with was great. The boxes arrive separately, and are quite heavy. Get help. The actual set-up is much easier than getting your fireplace ready for the install. By the time you finish the install with the sand, etc. you will be pleased with the results. Fast delivery, 2 days after ordering! Boxes were packaged well, product came as described and easy to install. I would order again! Second Set of This Design! 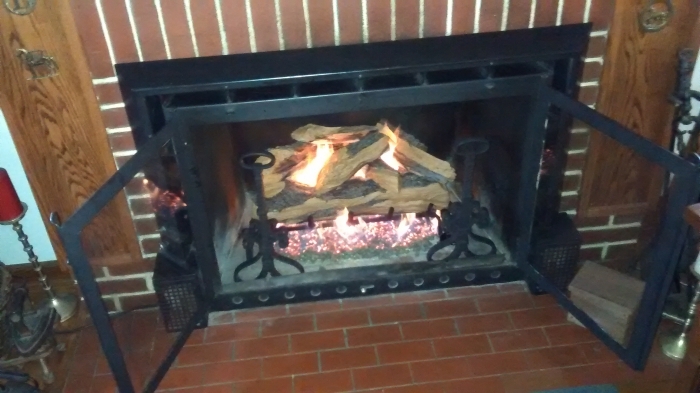 We installed our second set of these logs in a larger fireplace. Looks great. Love the variable flame remote control. ...Was easy to install and looks great!! 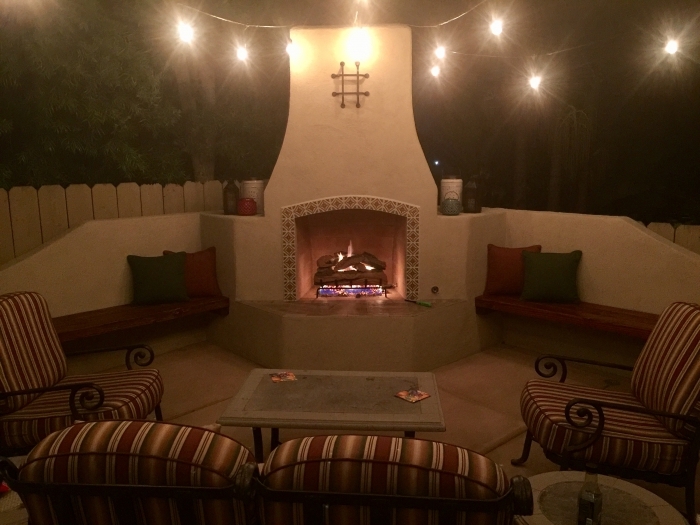 This review is for the Real Fyre 18" Split Oak Designer Natural Gas Vented Set - Match Light. We received the log set when promised. It was delivered in two boxes; one box contained the logs and one box contained the grate, burner, and accessories. All items arrived in good condition and nothing was bent or broken. 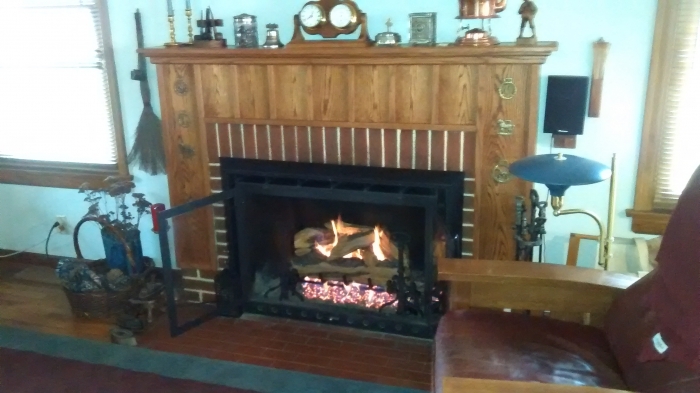 Our gas outlet was in the rear/center of the fireplace, which required the addition of a short pipe to run the gas over to the right side of the log set; the supplied flexible gas line was adequate for the remaining distance. The instructions (one for the burner and grate and one for the logs) were clear and understandable, and it took about 30 minutes to set up the entire log set. The gas burner starts up quickly and the flames look very realistic coming up through the logs. The supplied sand and fiber mix helped spread the flames out and also simulated burning ashes/embers. Overall, we are very happy with the choice. One caveat and a safety warning: An earlier owner had installed a wood burning fireplace insert in the fireplace, and the gas pipe/floor valve had not been used in quite some time, so we decided to have a plumber come out and make sure all was okay. It turned out that the section of gas pipe buried in the fireplace foundation had rotted out and the floor valve was frozen shut. Just a suggestion about making sure your gas system is A-Okay before setting up your gas log set. We experienced an easy installation, beautiful effect, and responsive customer service. The split oak log design looks like real wood. The size and scale of the logs are great. They look fantastic in our new fireplace. Good value and excellent quality. Well pleased, rapid shipment and easily installed by my journeyman plumber grandson! We received our order quickly and it was super easy to order online! Looks great both lit and unlit. Nice product. I would have given 5 starts but my installed said the grate and logs I received where not for a see thru fireplace. The grate had only one side that was bent up not both. Bought this set to improve the look of an oversized fireplace with old ceramic logs that were deteriorating after 22 years. Mixed the old with the new and it voila! I have only used this product for about 3 weeks, so I have rated it to four stars due to possible incomplete data regarding a full product assessment. The split logs and Triple T Gas Log Burner (both in appearance and performance) have performed at a 5 star level so far. We just converted our wood burning fireplace to gas. And, following some research, we completed the project conversion with this log set and burner. The instructions are well written and precise. I recommend pre-reading all of the instructions prior to purchase and installation. Pre-reading the instructions allowed for the ideal log-set size choice for our fireplace and for a smooth installation. My wife and our 3 year old are really enjoying this log set and our newly converted gas fire place. This is not the right configuration for you if you are looking for a primary heat source; this set and configuration is meant for the weekend casual /romantic weekend fire. Good for the environment (no more "spare the air" days) and no more clean-up! Awesome product so far! ProsGood for the environment (no more "spare the air" days) and no more clean-up! Really like the look of these logs! These logs really look great when lit and when not! We've been looking for a new set for about 5 years and couldn't find any we liked in stores. These are great and the new burner adds to the ambiance! ProsQuick shipment and arrival. Ease in installation. Realistic looking. ConsOne log was broken upon arrival. Have filed a warranty claim. Needs better packaging. The closest realistic fire without real logs. Provides the ambiance and some heat without the smoke and environmental impacts. We love it! The flame is great. It Really looks better than I was expecting. This gas log set was easy to assemble and install. It looks fantastic! Just like the picture, these logs look real, and work great. Very pleased with the price at $100 less than a local store. Love our new Real Fyre See Thru 18" Split Oak Designer Plus Vented log set. I've wanted to get log since we bought the house 10 years ago, can't believe I waited this long. I was hesitant because we have a two sided fireplace, but the logs are perfect and the fire is so realistic. Wished I would have purchased these years ago. Great Set of Fire Logs! Beautiful! Easy to install, make sure silicate is packed down firmly. This allows the gas to be distributed evenly. When embers are added looks just like a wood fire. ConsIf used a lot gas bill will show it. The log set is really nice. Very real looking and works well. Very easy to install. I got the 30" because I have a big fireplace so it was important that it look nice. I rec'd my set the week before Christmas. One log was broken and there was a little bit of delay getting a response from the warranty dept, but once I emailed about the non-response, I promptly received a call and email. They shipped a replacement log out with 2 day delivery so I would receive it by Christmas eve. I really appreciated that and it was so nice having a pretty fire on Christmas eve & Christmas day. I'm really glad I ordered through here and do recommend them. ConsNo cons come to mind. This has greatly exceeded my expectations on every point. This product is able to warm our living area with the greatest of ease. It is incredibly durable, highly attractive, and very easy to put together. These logs are the real deal when it comes to quality of service and quality of appearance. It is quite clear that the designer intended to create a realistic looking product and has come extremely close to achieving that goal. These logs are durable and are nothing but quality on every front. The process of assembling this product was remarkably easy, and the heat output is simply stunning. We absolutely love this product. This is a very well made product that possesses instructions that are very easy to understand. The design is very attractive as well as highly realistic. I was amazed out how easy it was to put this product together and then how effective it has proven to be in keeping our living area nice and warm. This is a high quality product that comes at a terrific price. From including every conceivable part to coming at a terrific price, the only thing that you can say about this product is that it is a terrific deal. By far, this is the most realistic set of logs currently on the market, as well as is by far the best priced item to be found anywhere. This product has proven itself to be an exceptional upgrade to our existing masonry fireplace. Gone are all of the trips hauling ashes and wood in and out. In just nine seconds, you have a fire. The location of your fireplace happens to be in our family room, and one day, my wife got the idea to get gas logs for it. It was quite easy to convert the fireplace from wood to gas, and best of all, the messiness of wood fires have been completely eliminated.